I am staring my Ibanez Epiphone project today! I will be replicating my Epiphone Wilshire body, same as Ibanez did for Paul & Bruce...although Paul’s was an Olympic but the specs are the same! I also hope to turn this black Epi Wilshire into the original Telesavalas...someday! There has been a lot of talk from people about building this guitar, but I have never seen one completed yet...I will certainly give it my best shot! By the by, who owns Paul’s Pink Ibanez Epiphone? Wow this should be a cool project. Cant wait to see it finished, your destroyer/iceman i saw looks amazing, hope this is just as good! I always wanted to build a replica of bruces green epi, maybe i will now haha. 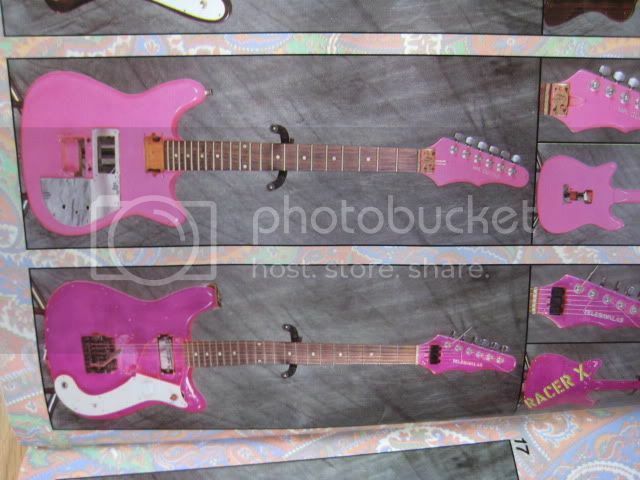 About pauls pink epi, i heard from somewhere that it was auctioned off on a japanese radio station a few years back, maybe im wrong but thats what i seem to remember for some reason lol Hope someone can back me up on this! As for the colour I don't know...I love them both! I could always make two! Wow, you sure keep busy! Looks like another cool project. pimp the black one? less hassle. i got my 64 olympic, looks like it got towed behind a car! never ruined it with a kahler though! Looking forward to seeing the progression of this! I will hotrod my black epi some day, but I really like the Ibz Epis... can not resist building it! I already have 90% of the stuff I need! Well the glue is about 50% dry, another few hours and I will mark out the Epi shape!!! I have now cut out the Ibanez Epiphone [TM] shape! Very very very very cool man. Yeah, it will not be easy...it's not like there are blue prints out there!!! This is a new territory for me, only 2 of these thing exist...somewhere! All I got to go by is a few pictures and my instincts! Anyone here know what happened to Bruce's Green Ibanez Epi after it got stolen for his car?? I thought he smashed his green one at a concert. He has paul's pink EPI?!!??! Or he has pictures..
Has Surg got Paul's 60's modded Olympic?